Over the last few years, Namma Bengaluru has given the country some of the most talented music artists, there are many to name. One name that we've been watching for a while is, RAKA. Making a debut at a gig with no other than, Daddy G. [Massive Attack], there has been no looking back for this DJ/Producer, who also works as a Graphic Designer and an Illustrator. 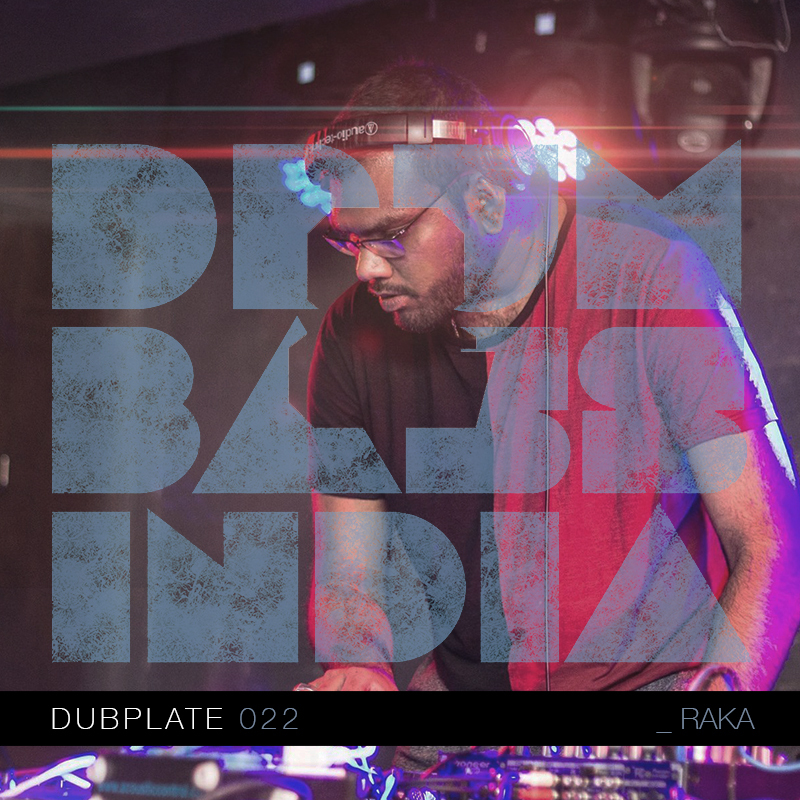 RAKA has made a number of tracks [in his own unique way], some sampled, some original and quite a few remixes, over the last couple of years, and news is he is soon going to be out with his EP! Let's find out more about what's this year is gong to be like for him. 1. Hey Raka, how are you doing? Glad to have you on board with us for #BassMondays. To begin with, tell us about how you started your music career as Raka, and how your taste/pick in music has evolved over time? A - I’m doing well thanks! Thank you so much for having me on #BassMondays! I started making music around 2007, with FL studio v.1, which was new to me (this was when v.8 was already out). But it wasn’t until 2012, that I was actually paid to make music, and around late 2015 that I started DJing as RAKA. As a beatmaker, my first paid gig was actually for a Kannada feature film, where I got to expand my knowledge on producing background scores for movies, under the guidance of Charan Raj, incredible music producer/close friend, I was working with at the time. Interestingly, he put me on to Hudson Mohawke and Lunice’s TNGHT EP as a reference to the kind of music I should make after he heard my first set of beats (https://raksolidmusic.bandcamp.com/ - yeah..that name), and that’s when I was introduced to proper bass music. It was only during my 1st PU/11th grade, that I was introduced to Hip-hop. Listening to Kanye West, Just Blaze,Timbaland, Neptunes, Danja instrumentals for countless hours that helped shape my sound and then moving to Diplo, M.I.A, Skrillex, TNGHT, DJ Fresh, Skepta, Wiley, Fixate, Joker, Wiley, Buraka Som Sistema, Ivy Lab, Om Unit, Alix Perez, and just so many more. Bass music is where I eventually found my home. 2. You’ve made a bunch of tunes in the past, ranging from remixes, originals, [with some of them heavily and brilliantly sampled] etc. Any particular process that you follow to work on a tune, starting from the ideation to the production bit; that you would want to throw some light on? 3. Word is that you’re releasing an EP soon, tell us a little about it. A - YES! I had been sleeping on this for a while, and I feel like my sound has a solid identity to it. It’s more of a tribute to my city - Bangalore. It’s a mixture of the traditional with the contemporary. The main idea behind this was to capture the sound of the city, and it’s cultural diversity today. 4. Also working as a Graphic Designer and an Illustrator, you make creatives for gigs and music collaborations, which are really on point, we feel. For the creative people out there, doing multiple jobs like these, share how you connect design and music? A - I feel like I’m in a good place right now, where I’m getting to combine my love for art and music together on a daily basis. Designing gig posters allows me to do that. Both design and music, go hand in hand, and the latter strongly influences the art I make. I feel that gig posters need to represent the rapidly evolving culture here, and the art needs to align with that. Before I even begin translating my ideas on to the screen, I always listen to the artist that I’m creating the artwork for, and feed off the vibe of their music, just let the ideas flow from there. It’s a pretty spontaneous process. Most of the work I do stems from the first idea that comes off the top of my head. 5. What do you feel about the Bass scene in India and what are your thoughts on its evolution so far? Also, what’s your take on the global bass scene? A - I absolutely love where the bass scene in India is headed. There are some incredible homegrown producers spread across the country that are making crazy eclectic music. It’s pretty inspiring to be in the middle of all this, and right now is the best time to be making music as an artist. I absolutely love global bass music. Mainly because of the way artists in this sphere have infused the sound of their culture and tradition into heavy bass music to make it their own. It was only a couple years ago, that I came across Buraka Som Sistema, Copia Doble Sistema, Tropkillaz, Alo Wala, and was blown away by how eclectic this sound was. I love what they’re all doing, and I feel like I can represent my culture, my identity in a similar fashion. 6. How’s 2017 looking for Raka? What’s in store for us, anything on going [Gigs, collaborations] that you are really excited about and would like to share with us? A - Collaborations with other homegrown producers are definitely in the pipeline. There are a couple tracks I’ve worked on for the #1beat1week exercise (created by Ketan Bahirat/Oceantied), that I feel are good enough to be made as full length tracks. This year for me is really just about making music that is true to who I am, and simply creating more. I haven’t put out much in the past couple years, but I look forward to sharing a lot more this year. 7. What is your studio / DJ set-up? A - I use a 15” Macbook Pro w/ Retina display for my art and music. I run Ableton 9 on it. As for the hardware, I have an M-Audio Axiom 49 keyboard, A Traktor S2 MK2 Controller, and a pair of Audio Technica M-50x headphones, Creative T-40 series II speakers that do the job for me at the moment. A - By far the best and the most memorable one - October 23 2015 - My debut gig as a DJ at The Humming Tree, where I got the opportunity to open for Daddy G (Massive Attack). I was given a 30 minute slot, but ended up playing for a good 45 mins. Shout out to The Humming Tree/Nikhil Barua for giving me that one shot. That was my first time ever, playing in front of a couple hundred people. Couldn’t have asked for a better way to start my career as a DJ. A : This one guy walking up to me to wish me Happy Friendship Day over and over again, followed by his friend who kept requesting me to play some David Gutka. A : LURUBASS - cuz why not?